皆、ようこそようこそ！While there are countless memorable characters and an abundance of satisfying narratives told in anime, a series’ ability to stand above the crowd for me personally much of the time is thanks to its smaller, seemingly meaningless moments dotted here or there, spurred from something relatable or oddly nostalgic which takes something small and strikes a chord in a big way. For example, in the currently airing Kobayashi-san chi no Maid Dragon, there is a scene in which Kobayashi and Tohru take Kanna shopping for school supplies, and after an enthusiastic spurt of shopping has taken place, the trio takes a randoseru to the counter to purchase it. Kanna is distracted by a cute charm and walks off to collect it while Kobayashi comes to terms with the price tag attached to the randoseru. Kanna realizes how much Kobayashi is already going out of her way for her and willfully without even proposing its purchase, returns the charm to the rack. Unknown to her, Kobayashi sees this, and in a later scene it is revealed that she had purchased the charm for Kanna afterward. This reminded me of a similar moment during my childhood in which during a trip to the grocery, I spotted a Sonic the Hedgehog book, and was quite interested in it as goods related to video games were a much rarer sight back then. We were already checking out though, so I didn’t want to ask for it. A week or so later, a relative surprised me with the book. Non Non Biyori had a similarly surprising scene in which the girls built and played with styrofoam gliders, which were something I remember my grandparents gifting my brother and I when they visited during our childhood. I had forgotten those things even existed, and seeing them appear in a series originating from the other side of the world was doubly striking. I suppose the take away here is “If you want your series to be impactful, remind me of my childhood!” Easier said than done in most cases of course. 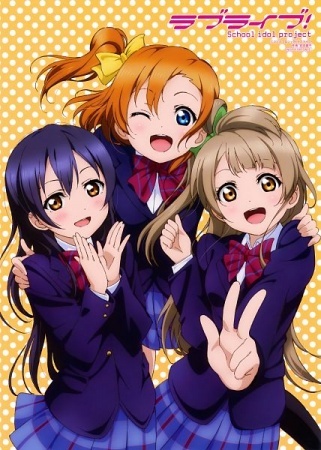 Kousaka Honoka is an endlessly bright and energetic girl who attends the now aging Otonokizaka High. Her mother attended this same high school, and Honoka is beyond traumatized to discover that this school, due to lack of interest in prospective new students, will be shutting down within the next few years. She refuses to give up without a fight though, and has an epiphany upon learning that a new trend has seen high schools across the country reach popularity through having Idol groups comprised of their students. Using that knowledge as a springboard, she enlists a couple of friends and seeks to create an Idol group for Otonokizaka High. I enjoy slice of life comedy series; I also find the Idol industry fascinating. Marrying the two seems like a match made in heaven, right? Well, I suppose for someone such as myself, yes, that would seem to be the case. This is a widely loved series, and from the very first episode it was easy to understand why. The characters in many cases happen to adhere to existing tropes, with a tsundere here, or a doofy but energetic protagonist there, but with what has been seen elsewhere countless times at this point, Love Live! manages to reinforce what makes these tropes so lovable and memorable with a narrative steeped in funny character moments and uplifting triumphant scenes. It can and likely has been argued that the interactions between the ladies of Muse and their fans and classmates aren’t all that realistic, but it’s in service of being in at least some small way inspiring, and for that I appreciated what Love Live! did. These characters and their stories are likable, but the subtle star of Love Live! is the production. I was dismayed to see CG character art used during the performance scenes (even during the OP? what in the world..? ), especially in a series where in 2D, the character designs are so gorgeous, but for a television production, I can reluctantly accept it, and the series more than makes up for it with its superb 2D art, attentive sound design and terrific soundtrack. The moe is front and center, but there was clearly a lot of love and thought put into everything surrounding it as well, and there wasn’t a stray moment in this series which I didn’t enjoy. If you’re into moe, this series is for you. If you’re into Idols, this series is for you. Slice of life comedy? Yep. And if you enjoy watching anime from an academic standpoint, and can appreciate its wonderful production, there is plenty here to enjoy for your type as well. Aside from the go-to series (Kobayashi and Demi-chan), I’m continually impressed with Yamishibai’s fourth season. They’ve been doing such an effective job at creating tension and unease in such a small run time, and though it’s perhaps jumping the gun a bit, I think I might be enjoying this season more than the first. It has been my kind of horror; no gore, with limited jump scares and more emphasis on mood, and I hope they can keep it up for what’s left of the Winter anime season. Looking to sleep through what’s left of the cold weather!